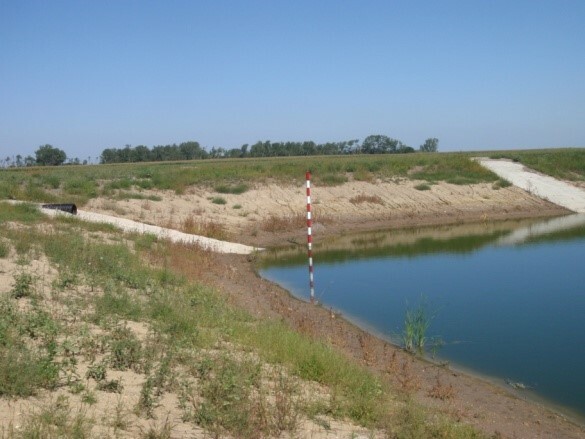 A properly functioning liquid level marker enables the producer to easily determine the storage capacity of pond, make management decisions and record storage conditions of the pond during regular inspections. What is a liquid level marker and why is it needed? Liquid level markers or indicators are a simple but important component of a manure storage facility that is required by state regulations (North Dakota Livestock Program Design Manual 5.2). A properly functioning liquid level marker enables the producer to easily determine the storage capacity of the pond, make management decisions (to pump or not to pump) and record storage conditions of the pond during regular inspections. State and federal regulations require that manure storage have the minimum capability to hold the annual lot runoff and direct rainfall, as well as runoff and rainfall resulting from a 25-year, 24-hour storm or 100-year, 24-hour storm event, depending on the type of livestock (Fig. 1). 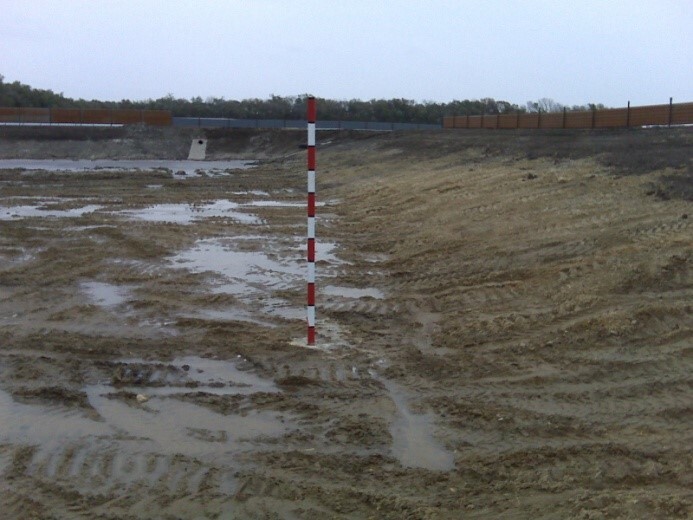 In addition to the operating storage volume of the pond, freeboard (the vertical distance between the maximum water-holding depth and the overtopping elevation) is required to protect against situations in which extreme runoff may occur. The typical freeboard distance is a minimum of 1 foot. Fig. 1. 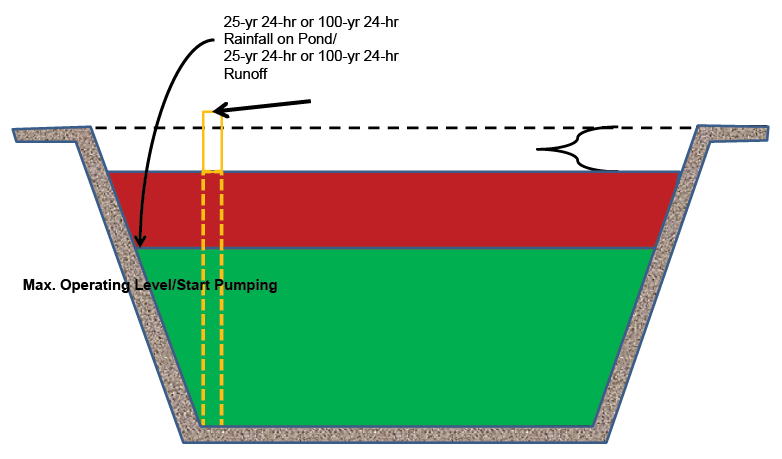 Capacity of a runoff storage pond (not to scale). Many markers also include markings indicating 1-foot storage increments (Fig. 2). These markings are a great way to assist in regular recording of the depth of water in the pond. Vertical markers can be constructed of many materials. The marker should be of a long-lasting, durable material that can stand up to the wet conditions and ice movement during the winter. The actual water elevation indicator could be any number of things: paint a nailed board; an embedded large nail, bolt or pin; a saw cut or notch; or a collar around the post. Sloping or side-wall markers are another effective way to indicate the water depth in the pond (Fig. 3). The typical construction material for side-slope markers is concrete. A very simple version of the side-slope marker could be stakes on the side slope of the pond. 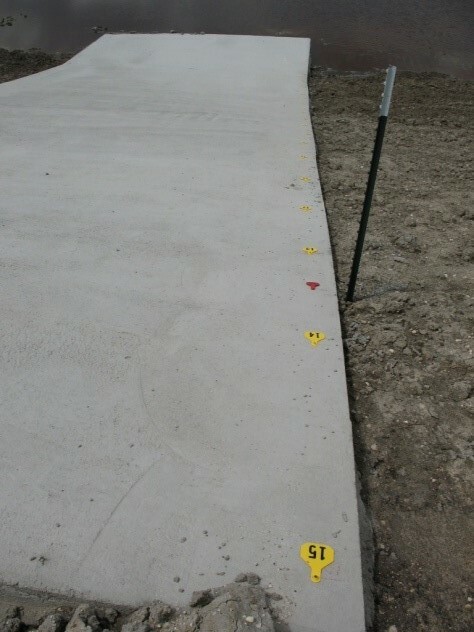 For structural markers, the important pond levels could be indicated by scoring the concrete, affixing ear tags to the concrete or placing a stake on the side slope of the pond berm. An advantage of a concrete side-slope marker is that it could be used as an access point to the bottom of the pond for maintenance purposes. 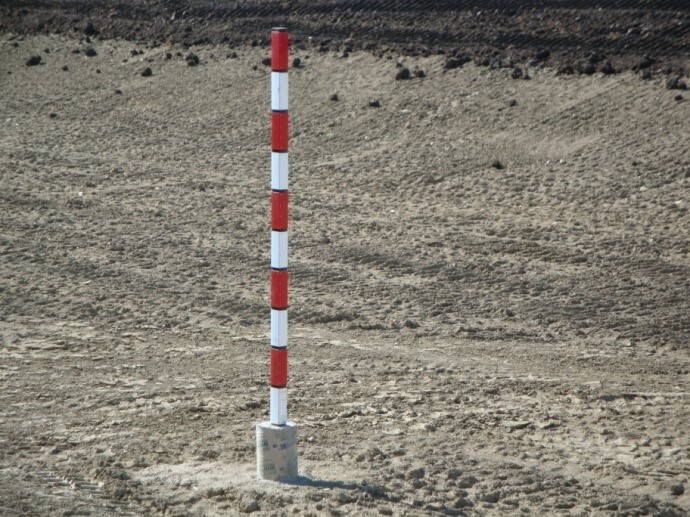 However, depending on the size of the pond or marker, these types of markers may not be visible everywhere, and they tend to be more costly than a vertical marker. 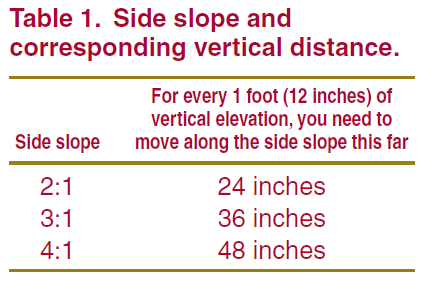 The following side-slope ratio information can be used as a guide line to move pond markers along the side slope. The ideal time to construct the pond marker is during the construction of the pond or when the pond level is low or empty (Fig. 4). Installing it then will ensure accuracy and longevity. However, a pond marker may be installed in an active pond in a number of ways, but the installer must take proper care and precautions. A vertical marker may be constructed outside of the pond, anchored in concrete and placed on top of the ice layer covering the pond in the winter. Take precautions while working on ice. The North Dakota Game and Fish Department recommends ice be 4 inches thick before anyone walks on it. Additionally, an observer needs to be present with a rope ready to assist the marker’s installer in case the ice breaks. As the ice melts, the marker will sink to the bottom of the pond. The marker must remain vertical while the ice melts. The best time to install a concrete marker to be placed on the slope is when the pond level has been pumped down. An important thing to remember is that if the pond has a liner, take care to ensure that the installation doesn’t damage the liner. 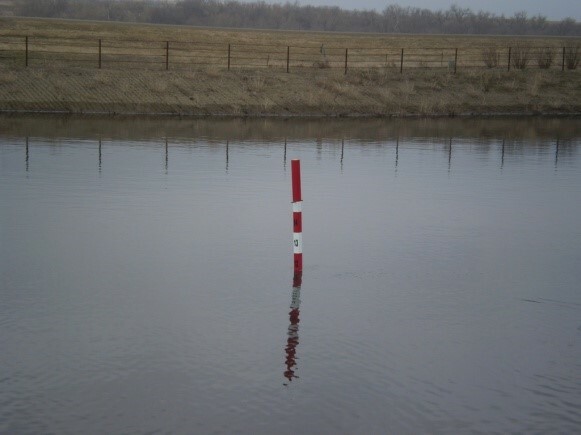 A large number of effective pond markers are available. What the marker looks like does not matter; the important thing to remember is that the water level in the pond needs to be managed. 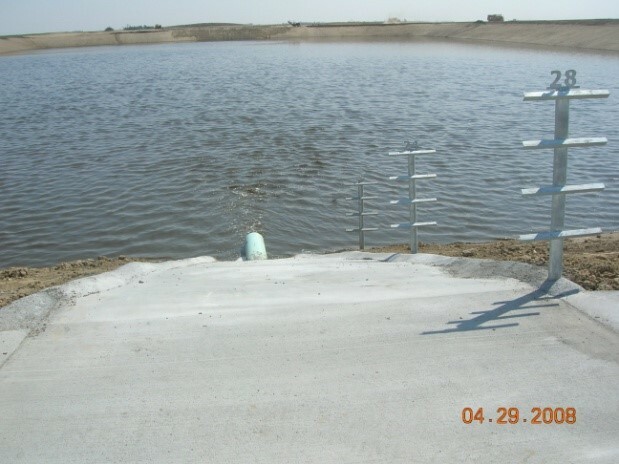 The pond marker is a great tool that helps producers make the best management decisions for a facility to prevent an unexpected overflow.